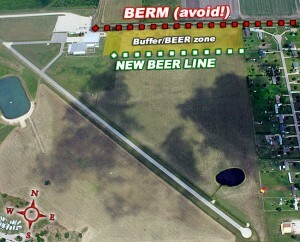 Ah, the beer line–that line close to the hangar that causes all skydivers in sight distance to yell “BEER!!! !” with glee if you land on the hangar side of it. Did you know we now have one of these in the student/A-B license landing area at our Houston location in addition to our regular beer line? Let me explain. The reference line is the new beer line. You might have noticed that we have a reference line mowed/burned in the grass, running east to west and extending out from the fence in front of the hangar. This line was created to build a buffer of safety from the north property line berm, because there is no good landing direction that favors landing next to it, just past it, or facing it. We call it an obstacle for a reason! The turbulence in that area can be ugly, potentially collapsing your canopy, and misreading the winds can leave you on the berm or in the ditch. Avoid this area at all costs! Especially when the winds are strong out of the south, our plan with that line is to have everyone plan to land south of it, pretending that the line is the berm. This way, if the winds are stronger than you realize and you end up landing further downwind (closer to the berm) than you intended, you have a buffer before you get to the real obstacle. 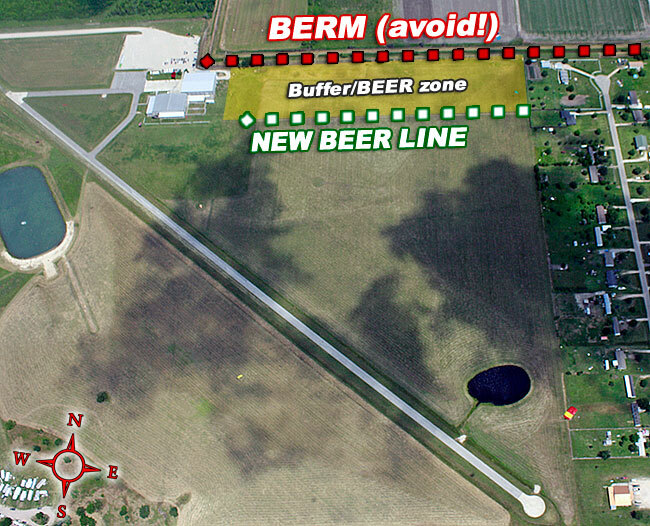 So now that the reference line is the new student beer line, if you are an STP student and you land between the beer line and the berm a few things could happen. At the least you will get a reminder from your instructor that you should not be landing there. We may consider that the winds are too strong for your current level of canopy skill and require you to stay on the ground until the winds drop. If you’re a licensed jumper and land there, well–BEER!!! If you land here repeatedly, we may need to review your wind limits. Florida students (and all other jumpers): This concept applies to you too! Anytime the winds are strong and there is an obstacle downwind of your target, create a buffer around that obstacle in your mind and fly your pattern such that you stay clear of your buffer zone. It’s all about safety! Stay well away from obstacles in any conditions, especially windy ones. Fly safe and let us know if you have any questions! Below 1000ft AGL, don’t fly over anything you aren’t willing to land on. Previous PostPrevious Skydiver Training Tip: To Land Off or Not?